Something funny happened to me today that has nothing to do with food. I am looking to buy a new car, but not really new more like second hand since I gave my Golf away. So the guy I went to meet who was selling his car, was not the one I thought I was supposed to meet. The car I thought I was going to see was a white Nissan with 9000 miles and the one I ended up meeting had a black Toyota with 28,000 miles. Basically I mixed up sellers. I have been acting strange lately, maybe I need some rest. Besides the confusion, I have had cravings for pasta, of all kinds and shapes. I have had a strange love story with pasta, somehow during my teenager years, I just refused to eat it, since my mom was making pasta al sugo at least once a week, with leftovers that lasted for a week. There were three of us, since I am an only child, and like a good Italian mamma, my mom made food for about an army, and my dad was complaining of eating leftovers. So after I rebelled against pasta like most teenagers do, they always rebel about something, I just went by phases, either I eat pasta seven days a week or just don’t eat any for months. Looks like, I am back with my daily consumption of carbs. I remember my mom making a soup with cauliflower and tomatoes that was delicious. This dish is inspired by a Sicilian pasta dish that I twisted around a little, and I loved it. If you have a cauliflower that has been sitting in your refrigerator and not sure what to do with it, you might want to try this pasta. You’ll be surprised to see how delicious the cauliflower sauce tastes, very light, not too strong, a real delight. In my case, I had a green cauliflower, that resulted in a beautiful greenish fettuccine dish. Cut cauliflower florets and cook them in salted boiling water. Cook until still a little crunchy. Drain cauliflower and keep the cooking water to cook pasta. With a potato masher or a fork, crush the floret roughly. In a cup, mix about 1/3 cup or more hot cauliflower water with saffron threads and let it infuse for about 10 minutes. Dissolve a bouillon cube in it. (You might have to add some additional water if the sauce is too thick). In a pan, heat olive oil and brown shallots. Add cauliflower and mix well. Add bouillon mixture, and stir well and cook for a few minutes at high heat until some of the saffron and bouillon get absorbed by cauliflower and infused in the sauce. If the sauce is too thick add extra water. Adjust with salt and pepper. Add cream. At this point, you need to have a little creamy sauce (not too liquid) with cauliflower but not too much. 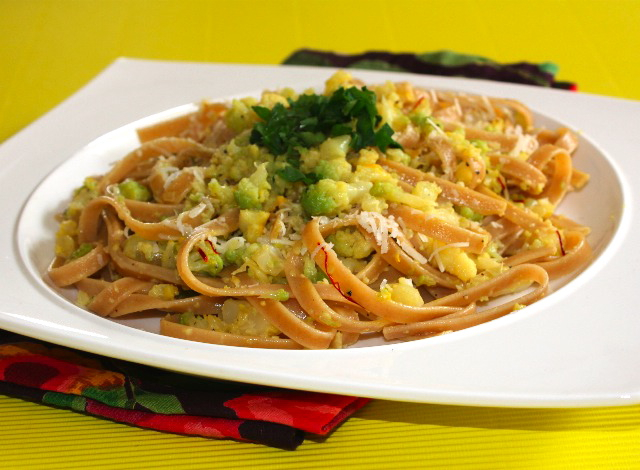 Cook fettuccine in the cauliflower water until al dente. Drain and add to the cauliflower. Mix well, let the fettuccine absorbe the sauce, add pecorino and serve hot. This entry was posted by silvia on December 9, 2009 at 12:21 am, and is filed under Pasta. Follow any responses to this post through RSS 2.0.You can leave a response or trackback from your own site. This sounds wonderful! As a matter of fact, I have a head of cauliflower in the fridge and was wondering what to do with it… Thanks! I love this twist on the Sicilian pasta and cauliflower dish. Cauliflower is one of those things I don’t use that often, and when I do I wonder why not because it’s so good. Great flavor combinations here…my stomach is growling! This looks amazing! I can’t say that I’ve ever had a pasta dish with cauliflower, but I love it, so I’ll have to have this a try! The colors of your pasta are spectacular. I bet the flavors are even better. This is an interesting combination that I would not have thought of but does sound delicious. I love quick pasta recipes too – they save me on nights I don’t feel like cooking. mmm, i’m never one to pass up a good pasta dish. i love cauliflower, too, so i’ll be sure to whip this one up next time i want some noodles. I get my dose of beautiful pasta dishes from your site since we don’t eat a lot of it at home. I’m hoping to make some this week, even if it will only be for me! What a wonderful pasta dish. This looks wonderful!